In a world first, Resene have pioneered a way that you can ensure the coating applied is authentic, with Resene PaintTrack. Resene PaintTrack is a ‘chemical barcode’ made up of durable and inert inorganic materials that are fully integrated into the paint. To the naked eye paints containing Resene PaintTrack look and perform the same as normal. When illuminated using light of a specific wavelength, a unique emission spectrum is detected by a hand-held digital reader if it contains Resene PaintTrack. The complexity of the chemical barcode is extremely difficult to decipher, preventing reproduction of the code and ensuring authenticity of the Resene product. A quick scan of a product can quickly show whether it is authentic or a lesser substitute. Unique codes can be assigned to specific high volume products if required, so that different products can be distinguished from each other. Selling products clearly marked as containing Resene PaintTrack discourages substitution. And if substitution does occur you can quickly and easily identify which areas have been finished in the wrong product so the system can be rectified before it is too late. It can also reduce the cost of investigating and resolving claims. If a problem occurs with a substituted coating years after application, a quick scan will show whether the wrong product was used, absolving the specifier of any product liability claims resulting from the substituted coating. 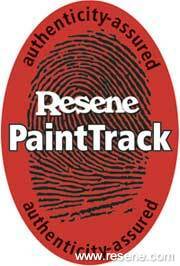 Resene PaintTrack provides you with peace of mind knowing that you can ensure your specified system is 100% authentic.